Creating kitchen elevations with free templates and examples. Kitchen elevations has never been easier. Do you want to have your dream kitchen? If so, Edraw would like to help you turn your dream kitchen into a reality. Kitchen planning is much more than making your kitchen look good-it's also about creating a wonderful place that celebrates your personality and style. You may ask your friends what they like and dislike about their own kitchens-which will definitely make it much easier to design your own dream kitchen. All we want is that you will be happy with your new kitchen designed via Edraw. Edraw is designed with a Kitchen elevation template, through which you can easily create professional-looking kitchen elevations. In the library, you can find a variety of pre-drawn elevation symbols, dimensions and wall elevations, which help customize any kitchen style to visualize your personal needs and expectations. It's easy-to-learn and easy-to-use, no CAD drawing skills required. You can export your design to many different formats. 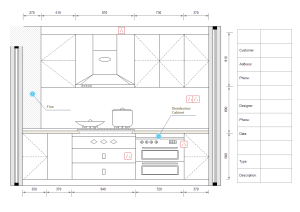 View this kitchen design example as a reference to get familiar with our kitchen design software. Download and use it as a template for fast kitchen designing. Check out kitchen layout tool or kitchen floor palnner here. 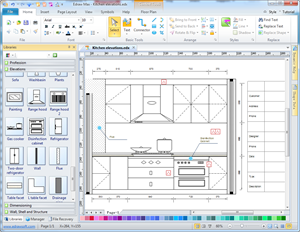 Download free printable kitchen layout templates here.